Ballet - Dancers in our ballet classes build strength, grace, poise, and flexibility. Our classes are carefully designed to follow a logical progression, allowing our students to see themselves advance. Their confidence soars as they see their hard work paying off (a great life lesson for all of us)! Dancers learn the standard dance positions and their corresponding French terminology. As dancers advance they are invited to begin pre-pointe work. We require all dancers taking jazz/lyrical to also take ballet, as ballet is the basis to all other dance styles. 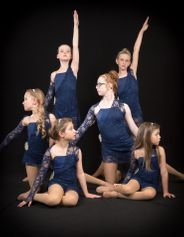 Jazz/Lyrical Combo - Jazz is an exciting and upbeat form of dance! Dancers learn kicks, turns and work on improving their strength and flexibility. Styles of Jazz range from the dance you see on a Broadway stage, to the dance in a basketball half time show. Set to popular music, Jazz is pure energy and tons of fun! In lyrical, dancers learn how to isolate and contraction the core muscles. Lyrical is slower paced and focuses on expression and flowing movements while utilizing the same 'tricks' learned in jazz. Tap - Tap is a style of dance using precise rhythmic patterns of foot movement. Dancers learn increased coordination and rhythm. Students develop the ability to count music and keep time. Tap is a high energy style that really gets the heart pumping! Music selections can vary from Broadway to today's Top 40 and everything in between. Tiny Tots Ballet/Tap Combo - These classes are designed to be fun and encouraging! Dancers practice fine motor skills and body awareness while getting all those silly wiggles out! Students learn basic ballet and tap moves (plié, tendu, shuffle) while having a blast dancing to fun and upbeat music! Dancers receive lots of encouragement to help build a positive self-image and lots of confidence. Dancers learn basic classroom behavior and etiquette (standing in line, waiting their turn) which prepares them for so many other experience, like Kindergarten! © 2019 To The Pointe Dance Academy . All Rights Reserved.